Halloween is only a few days away! I can feel the excitement in the air. My own children, who are teenagers, have been scouring the house looking for the Halloween candy which I have had to hide. 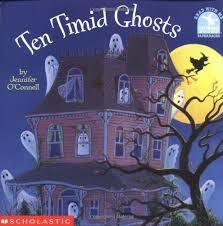 These are fun times for many children who celebrate Halloween! 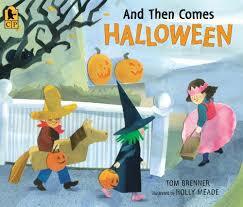 Children naturally engage in the world of make-believe in their daily play and Halloween highlights this. 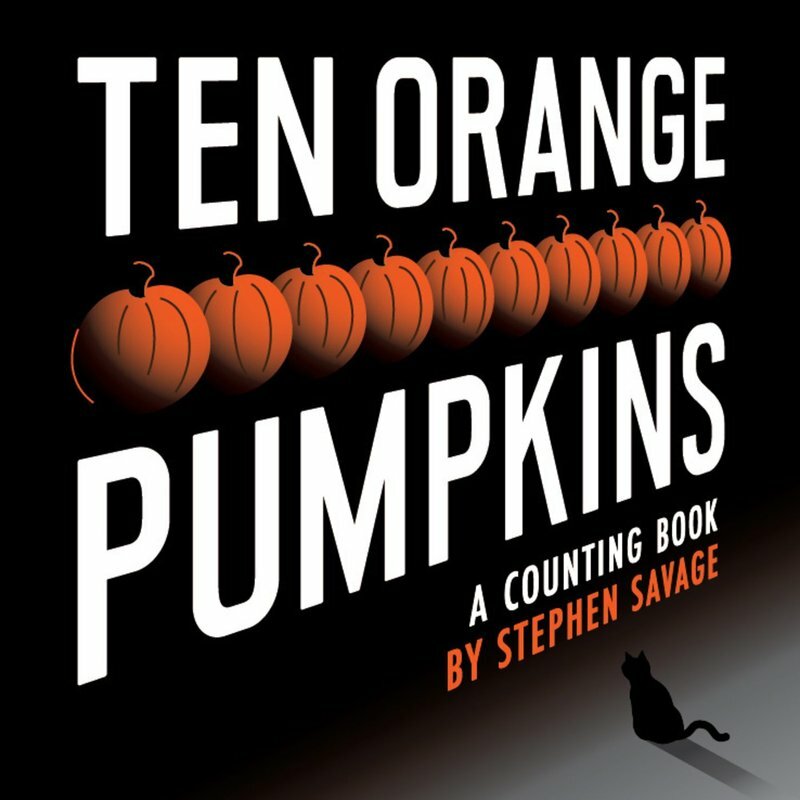 When I was teaching in the classroom, I would enjoy harnessing my students' excitement to plan motivating math learning experiences using their interest in Halloween. 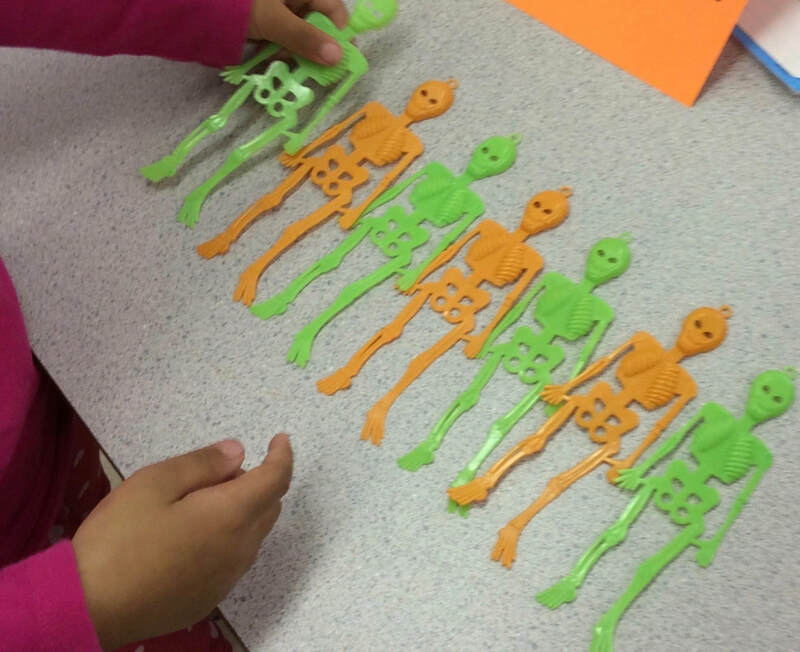 So similar to last year, when I shared some of my favourite ideas, this year I created some new playful, mathematical inquiry based Halloween experiences. I will be visiting a couple of classes this week to try these out, but I won't get a chance to try all of them. 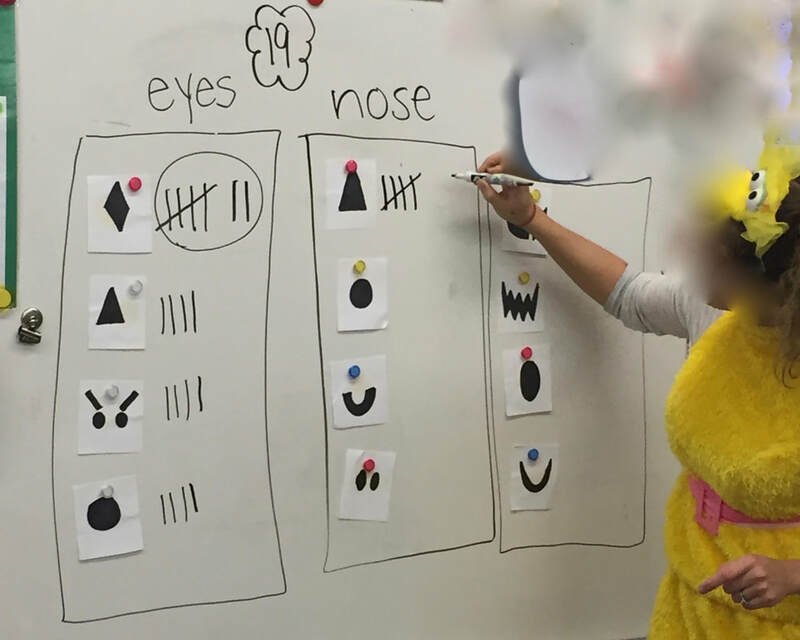 If you happen to try any of these ideas with your class, I would love to hear how they went. Please consider adding a comment/photos below. 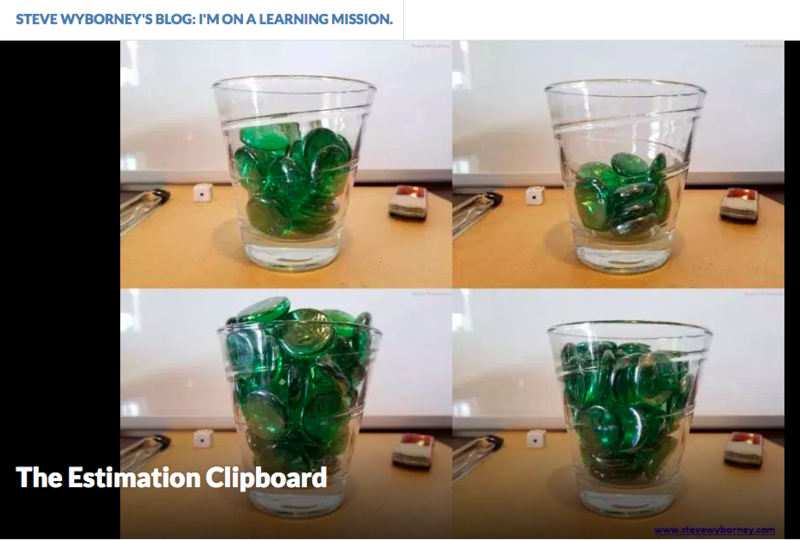 Many of you know, I am a big fan of Steve Wyborney's "Estimation Clipboard". For those of you unfamiliar with this, please check out Steve's site and/or my previous blogpost. 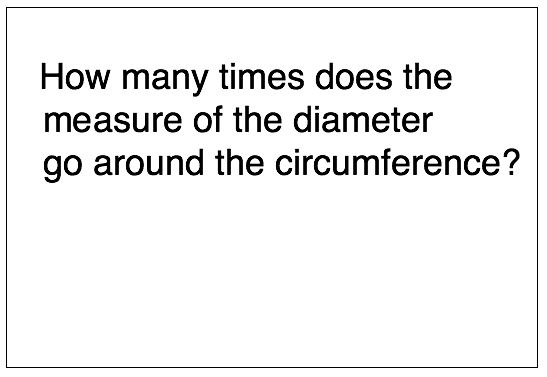 Share the initial image and ask students to estimate "How many?" aloud. After you have heard a few responses, reveal the amount. This information will move to the top left of the screen. The next slide will show another highly similar image. Again ask your students "How many?" 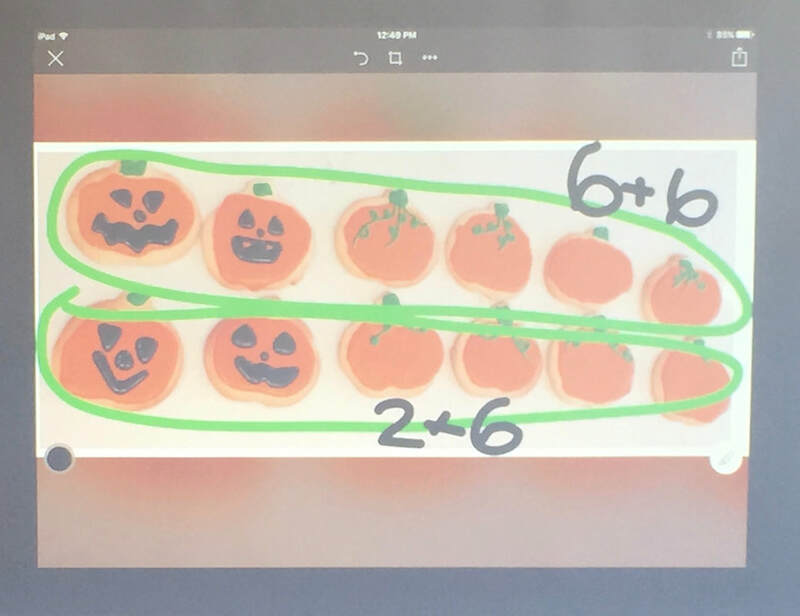 Since the images are similar, students now have some prior knowledge which they can tap into when estimating. After you have heard several estimates, reveal the answer. 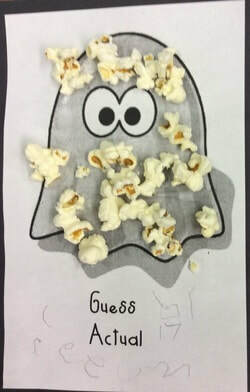 Following the reveal of how many items were in the second image, a third highly similar image is shared, but this time rather than share estimates aloud, students are asked to record their estimates.​ ​Once they have recorded their estimates Steve recommends a partner talk where students 1)share their estimate and 2) explain to their partner why they chose the number they did. What strategies or reasoning did they apply? Follow the same format for the fourth and final image. 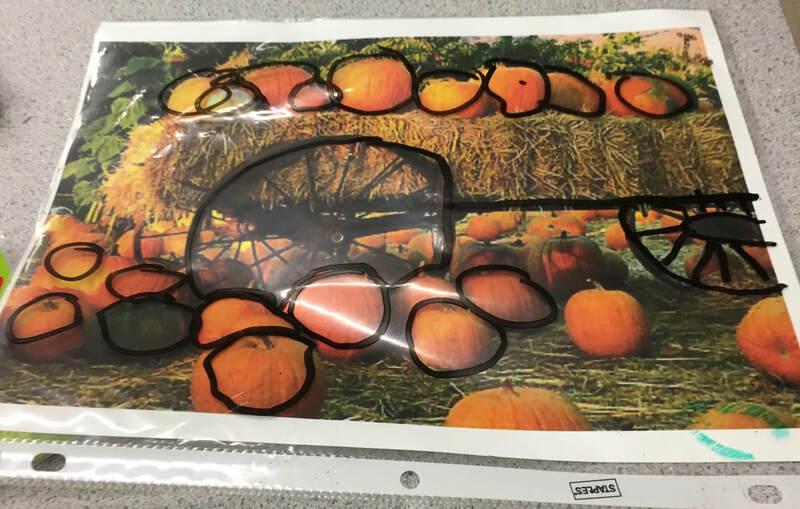 After all the images have been shown, ask your students what strategies they used to estimate. 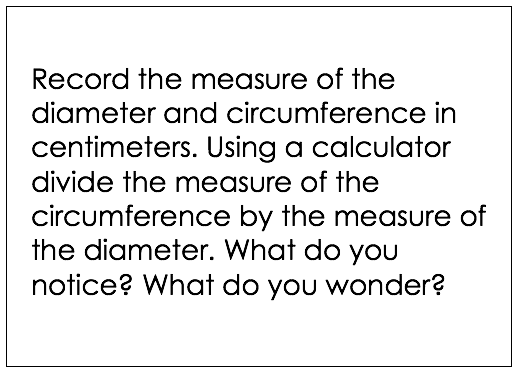 You may wish to record these on a chart that students can refer to for future estimation activities. 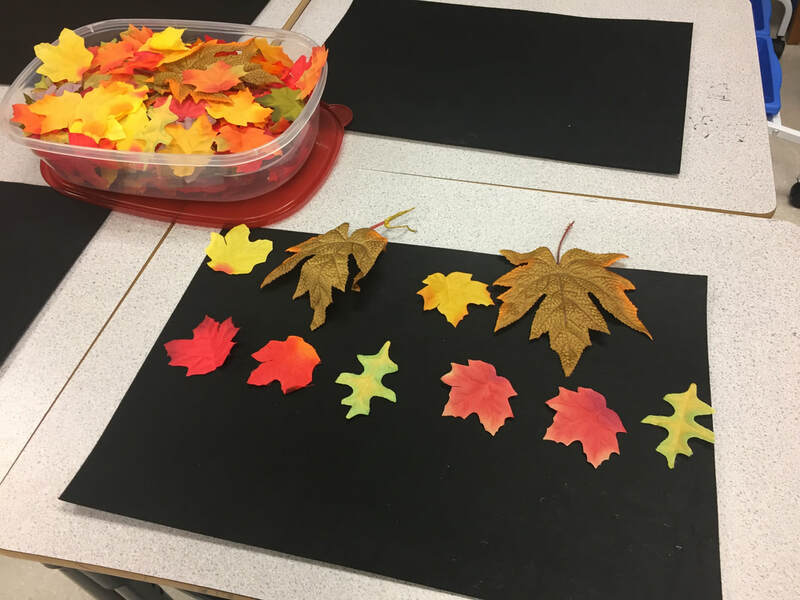 When creating these clipboards, my intention was to create images that would encourage students to visualize 'doubling' 'halving' to help them with their estimates. Another inquiry-based approach I am fond of is 'Three Act Tasks'. For those unfamiliar with this, I recommend you check out my Three Act Task page and blogpost. There you will learn about the pioneers of this approach, the learning involved, and instructions on how to use these with your classes. 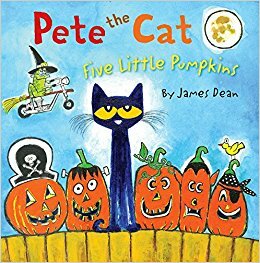 Below I am sharing some Halloween Three Act Tasks I have created. I am also including my thinking behind each task in the lesson design so that BC teachers can see how this aligns/connects with our own context. Content - Addition of many addends to 100. Numbers were intentionally selected to highlight finding partners to make tens. In my work with Primary teachers I am often asked "How do I engage my young students in problem solving activities?" There are many ways teachers do this but one approach I am very fond of is "Three Act Tasks". This problem-solving whole class approach can be used with students from Kindergarten to Grade 12. 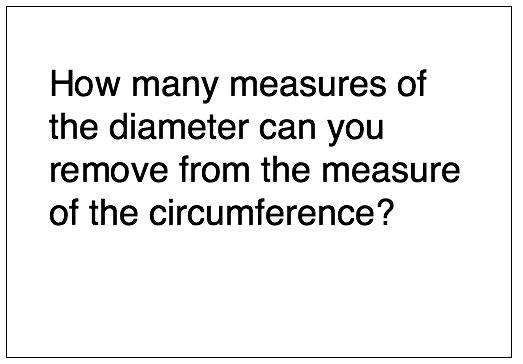 Originating from Dan Meyers for Secondary School Math classes, this problem based approach is an excellent way to develop students' ability to question, engage in problem solving, develop a range of strategies, and mathematically model. Every child has an entry point into the activity and can work to their potential. Dan has created a great video series explaining "Three Acts". 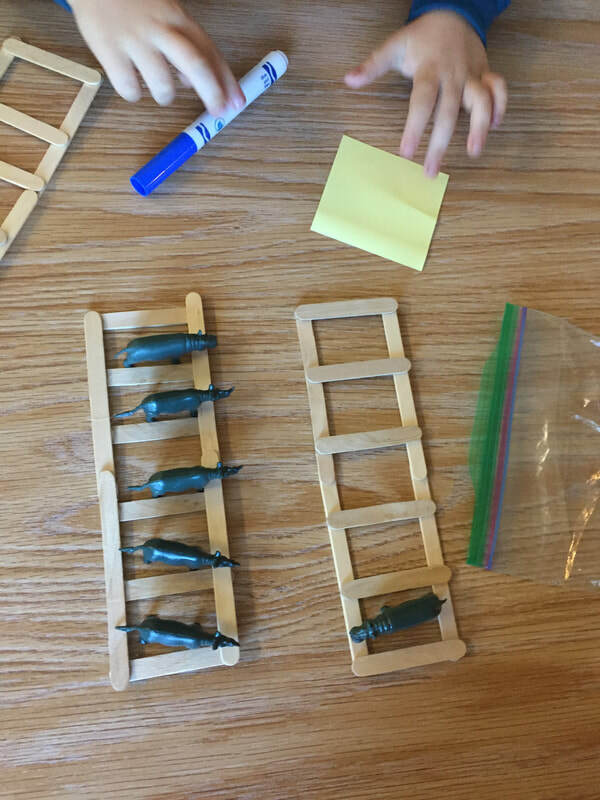 More recently, Graham Fletcher has created many 'Three Act Tasks' for Elementary aged students. I highly recommend checking out his site or Kendra Lomax's who has created some tasks for early primary students. For those teachers who have never heard of Three Acts, I recommend you pop over to Tedd.org to check out the resources they have created to support teachers with this approach. You will need to register but it is free. A summary of the Three Acts can be found here. ​Initially I began exploring this approach using Three Acts that had been created for K - 7 classes by Graham Fletcher and Kendra Lomax. As my confidence developed, I created a few of my own and wrote lesson plans that aligned with our BC Curriculum (see here).There is no right or wrong time to use a three-act task. 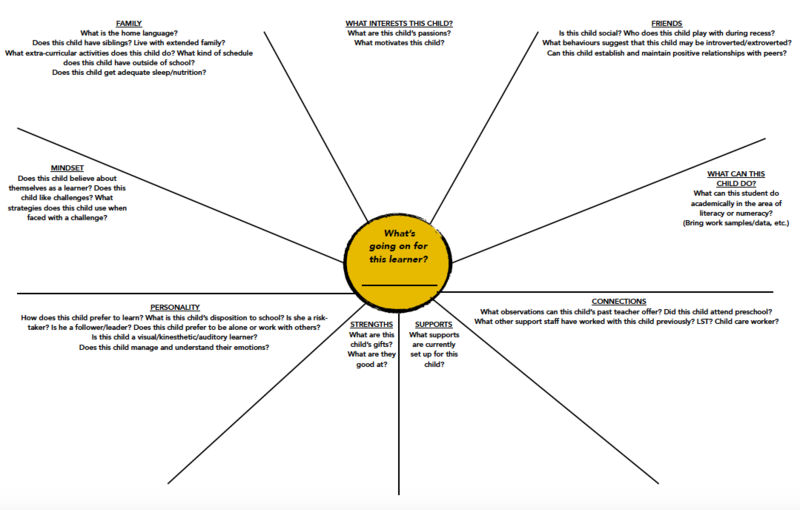 They can be used gather formative assessment at the beginning and middle of learning a new concept or near the end to see which strategies students are using and applying in new contexts. 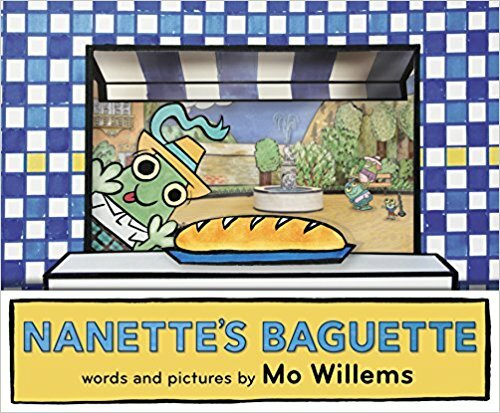 Last month I worked with two K/1 teachers to explore a "Three Act Task" I created connected to a favourite book called "Nanette's Baguette" by Moe Willems. These teachers wondered what strategies their students might use with a subtraction question. After reading the story, students were shown the short clip in Act One. We asked the students "What they noticed?" and following this "What they wondered?" When planning a 'three-act task' I think about what materials will help the students to represent their thinking. Then I organize these in an inviting way on a table and students come and take whatever they'd like to use. As you can see in the images, some students represented their thinking concretely by building models with unifix cubes. Others drew pictures and some used math tools like number lines and hundreds charts. Before revealing Act Three, students shared their strategies with the class. 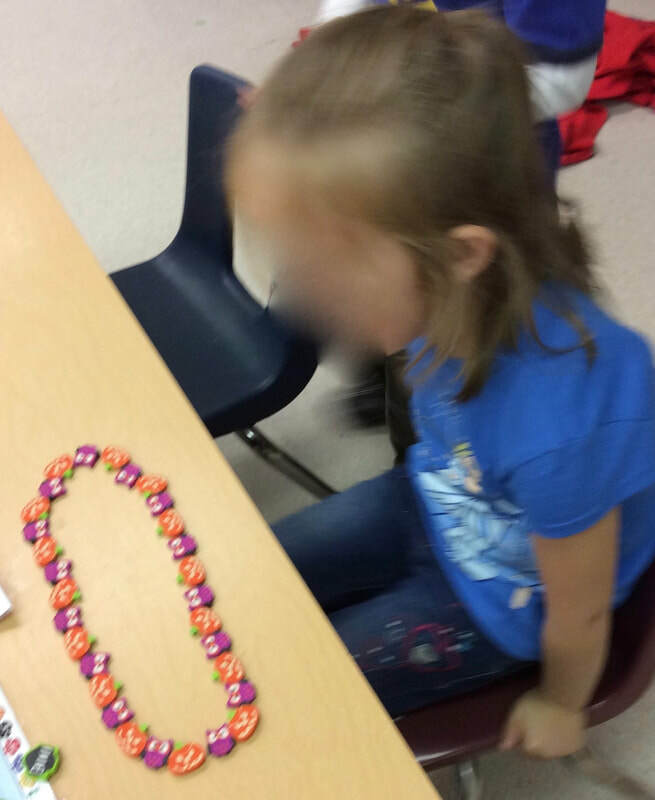 Most students counted back by ones, but one student counted back in chunk of ten. 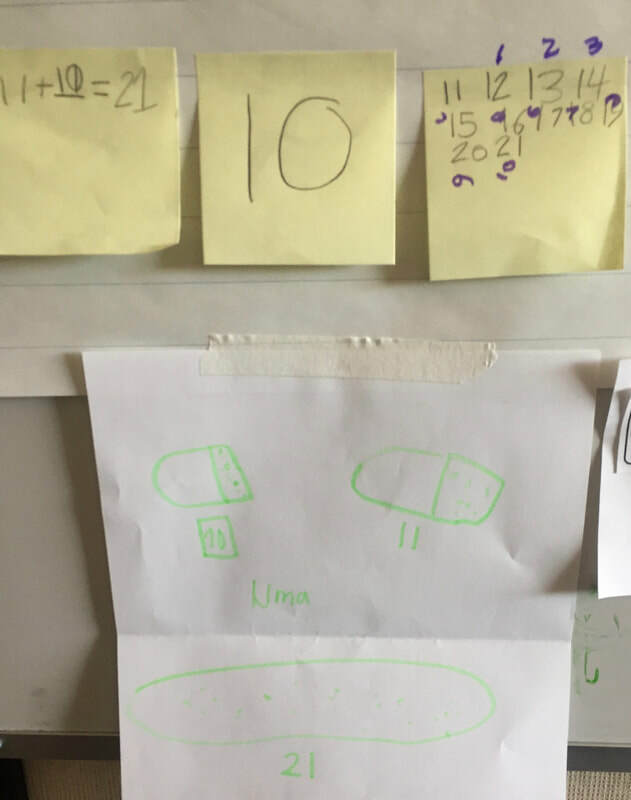 A couple of students thought about addition for subtraction and counted on from 10, either through a picture, or on a number line. I have created a few other primary three act tasks. Click here to see these! ​​If you have created some of your own 3 Act Tasks, I would love to hear about them and your reflections. For those who may not know, yesterday was International Pie Day - March 14th - 3.14 - the third month and fourteenth day. I know this post is a little late, but hopefully teachers still planning to explore Pi this year with their students will enjoy some of these ideas. 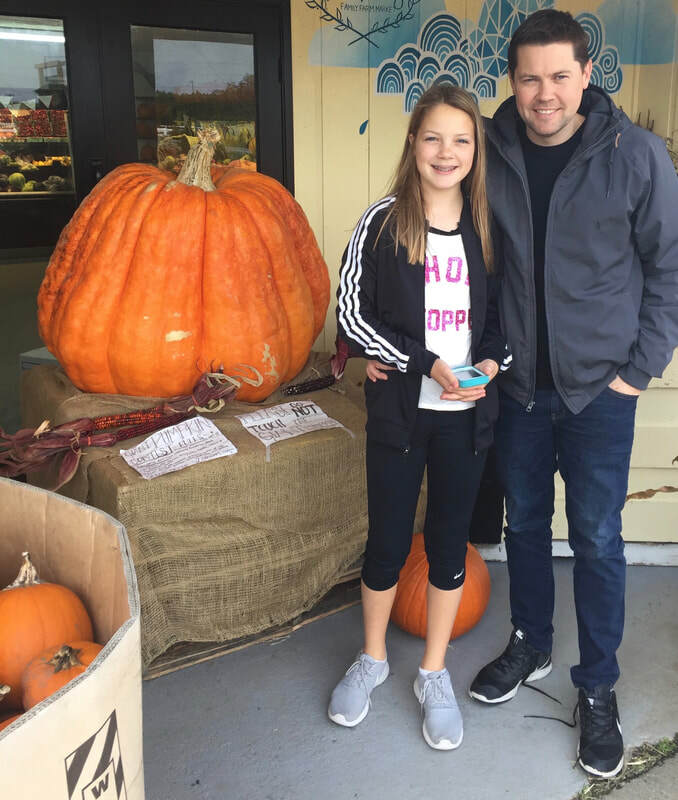 Yesterday I took the afternoon off to visit my daughter's Grades 6/7 class (Megan is in a different District that I am). Megan sees me leaving for classrooms daily with all sorts of interesting materials and is always curious about what I do with students. I figured before she gets to high school, where she won't want me setting foot on the premises, I would take the opportunity to ask if I could come and visit her class to explore Pi with them. Both she and her teacher were open to this idea. 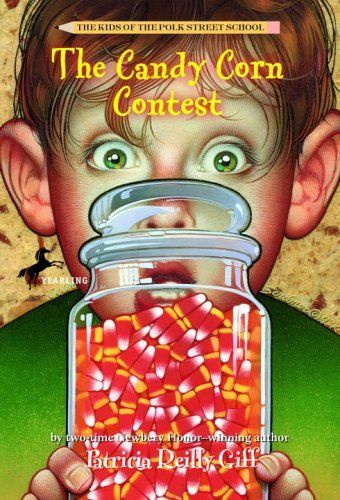 I began reading aloud Sir Circumference and the First Round Table by Cindy Neuschwander and Wayne Geehan. 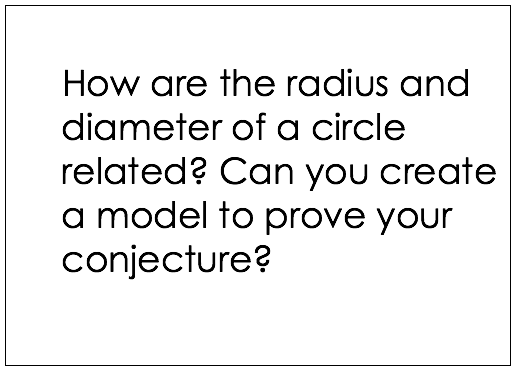 I wanted to activate students' background knowledge and initiate some new mathematical vocabulary for some students who may be unfamiliar with the following terms - radius, diameter, and circumference. Next we had a class discussion about what they know and wonder. There were a couple of students that had a great deal of knowledge, while others had no background experiences with this topic. I was thrilled when one student mentioned the word "ratio". He commented that he knew there was a ratio that was connected to the parts of a circle. 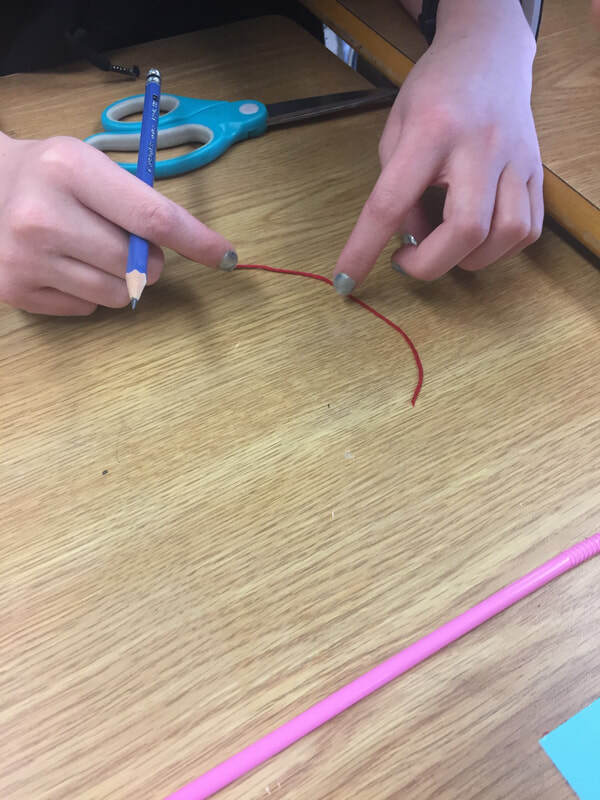 This was an outstanding segue to our learning intention for the lesson: Today we are going to explore what relationships exist between the parts of a circle. Once the learning intention was clear, students did a turn and talk and revoiced our purpose. Next I went over each learning exploration. I provided the four learning opportunities below. 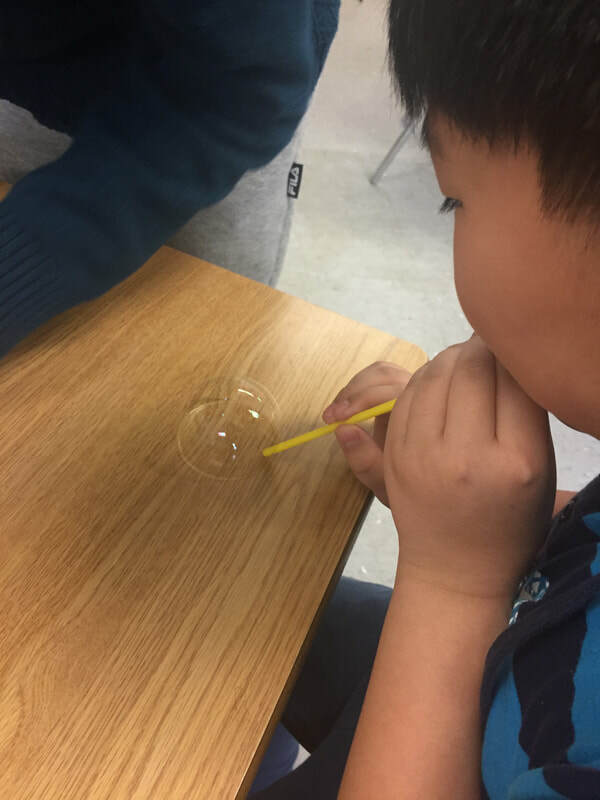 Using bubble solution, students blew a bubble on the table. This left a wet mark. Next they used thin string to cut and measure the diameter. 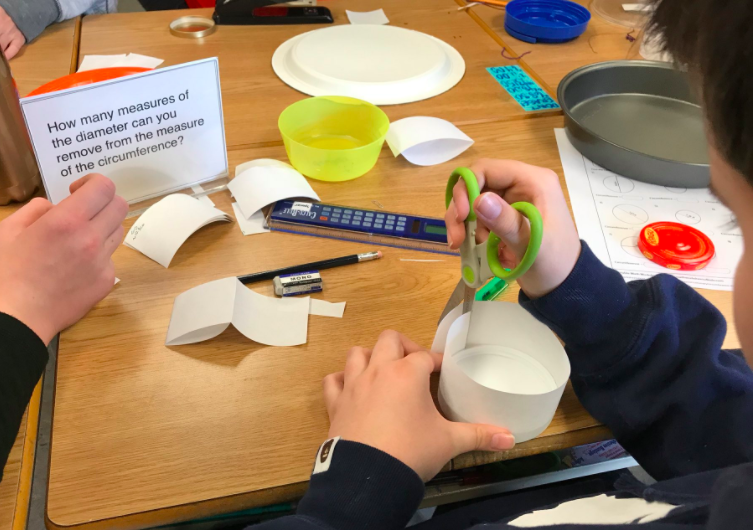 Together, with their partner they took the measure of the diameter and marked how many times it went around the circumference (iteration). 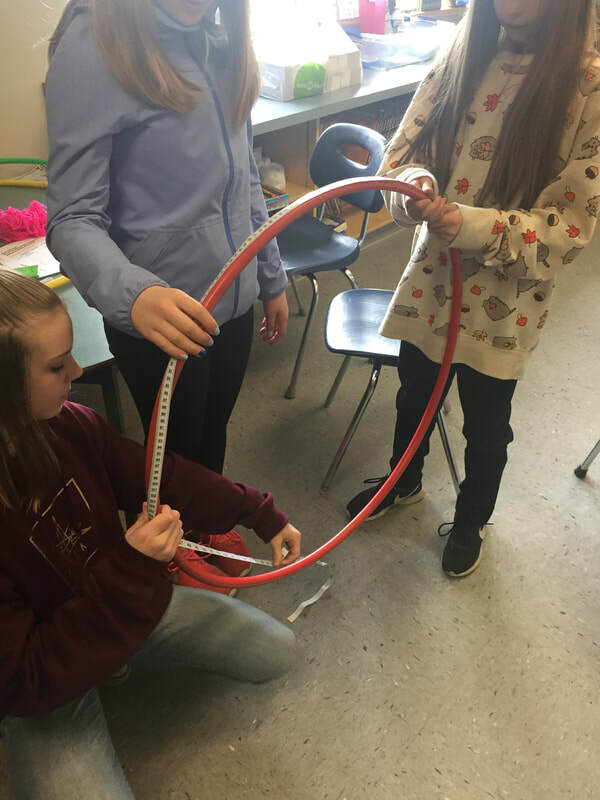 Students noticed that the measure of the diameter went around the circumference three and a bit times. Note - The bubble solution worked well to remove any pencil marks left on the desk. Using calculator adding tape, students measured the circumference of different circles (many different circular lids were provided). 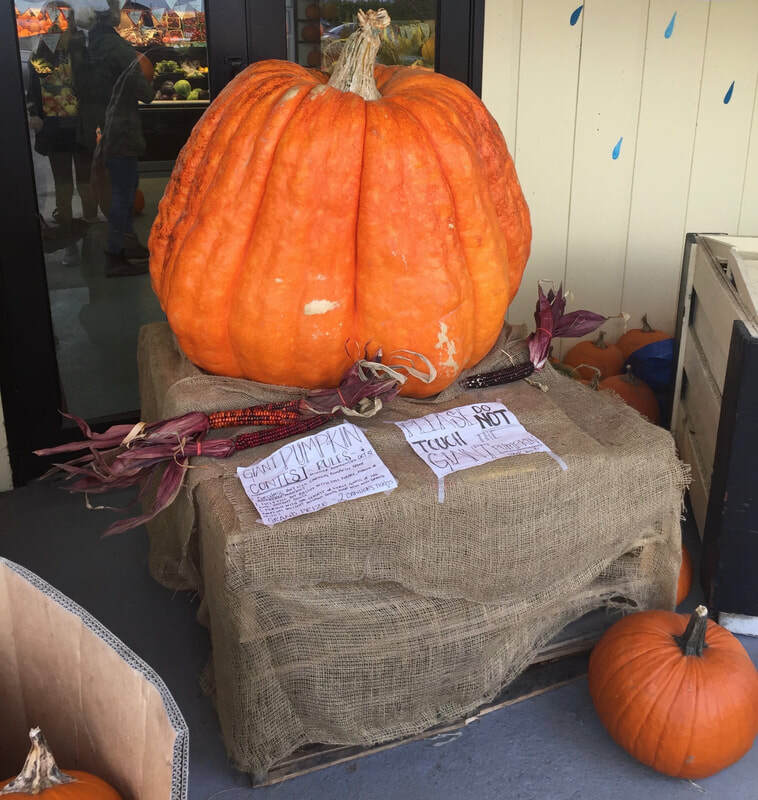 They cut this measurement. Next they overlaid this measure on the circle and cut the measure of the diameter. They did this as many times as they could. What they noticed was that with each circle they were able to remove the diameter approximately three and a bit times. We provided staplers so they could join the parts together to keep for reference. Above is the recording template provided to the students. 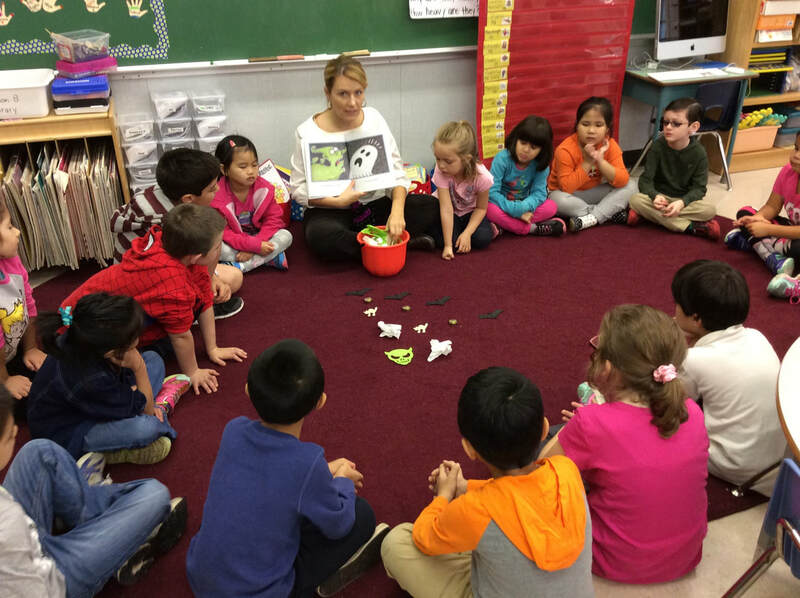 The students had about 30 - 40 minutes to engage with the different provocations. 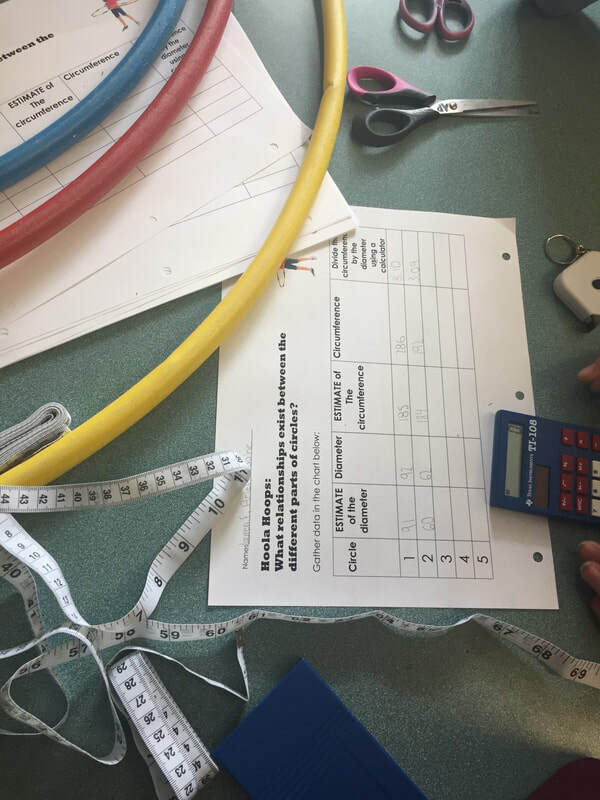 Students worked in pairs or groups of three, as it was important that they discuss their ideas, learn from each other, and have enough helping hands to iterate and measure. Students chose which learning opportunity they wanted to begin with and moved freely between explorations. We ended the lesson by gathering back together as a group and discussing what we noticed, what generalizations we were beginning to make, and any lingering questions they had. Students completed an exit slip, responding to "What did you learn today?" Lastly, we all enjoyed some tasty pie with ice cream and watch a video that summarized some of the ah-ha's we had during the lesson. Below is a copy of my plan and the exit slips"
Since my last blogpost about Changing Results, we have had three sessions: two full days and one after school session. In our full day session in late October, we began by reading an amazing anthology written by Richmond Primary educators called "What If?" 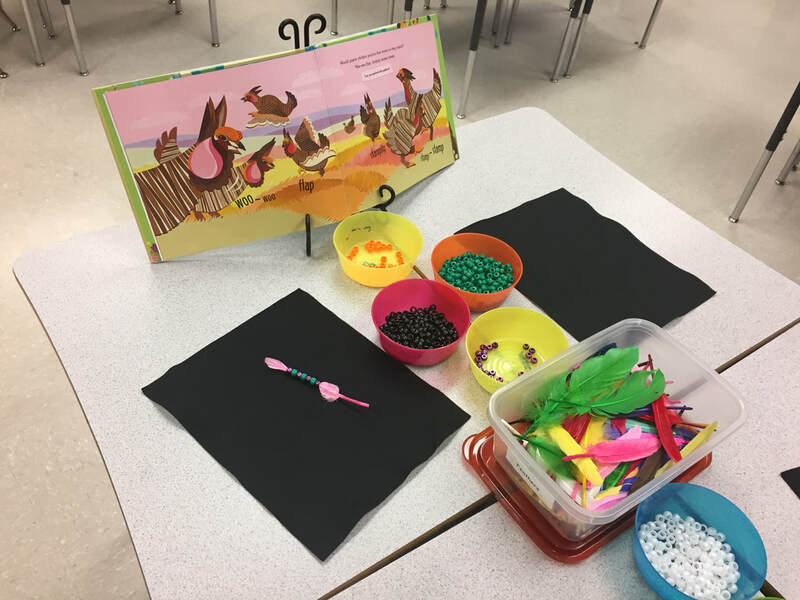 This collaborative resource details the learning journey of several Kindergarten teachers who asked important questions that were reflective and responsive. We felt this was similar to our work, with the exception that our inquiry questions were focused on one child. ​Inspired by the teachers in Richmond, we decided to take time to ask ourselves, "What do we believe about children and learning? We began by writing our thoughts on sticky notes and then categorizing these. Next we came together in small groups to with our notes and worked collaboratively to formalize our thoughts. It took time and few iterations but as you can see/read below, this was important work. We hope to continually revisit these beliefs and let them guide our work this year. Connected to this, we spent some time thinking about the language we use to describe our students. Sometimes when describing our case study students or during classroom visits I have heard students referred to as "low, struggling, or at-risk". We've all done it, myself included. These deficit based terms stand in stark contrast to the aim of Changing Results. The Changing Results initiative is about honouring our students and believing in their abilities. Our goal is to accept children as they are - to discover and celebrate their strengths - to find out what they know and take action to help move them forward. 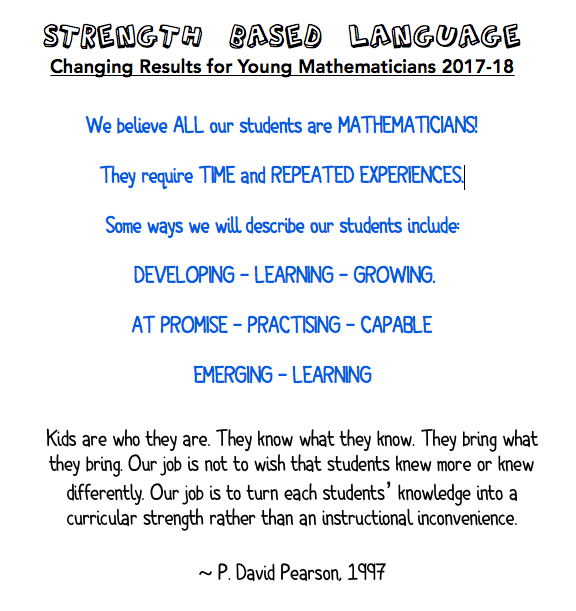 Janice Novakowski wrote a thoughtful blogpost on "What does it mean to be a 'low' math student?" She asks teachers some important, challenging questions. We used some of Janice's thoughtful questions, in combination with some other quotes and dictionary definitions, as provocations for a deep discussion about the importance of our professional language. 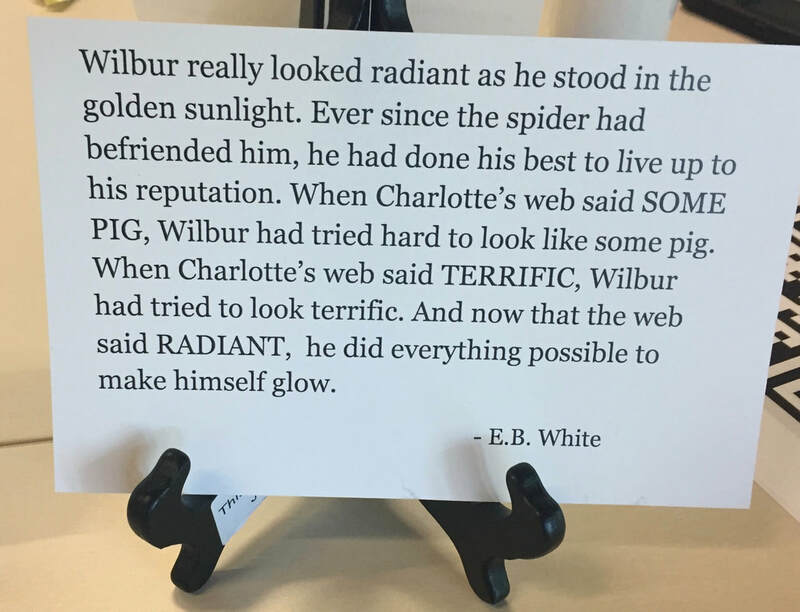 My colleague Ginny Tambre, who is the Changing Results for Young Readers Advocate, serendipitously was reading Charlotte's Web just before our session and came across the following passage. 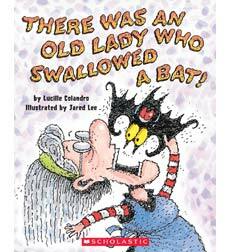 She wondered if Charlotte knew something we, as teachers, could learn from. What power lies in the words? Do we live up to what others believe about us? 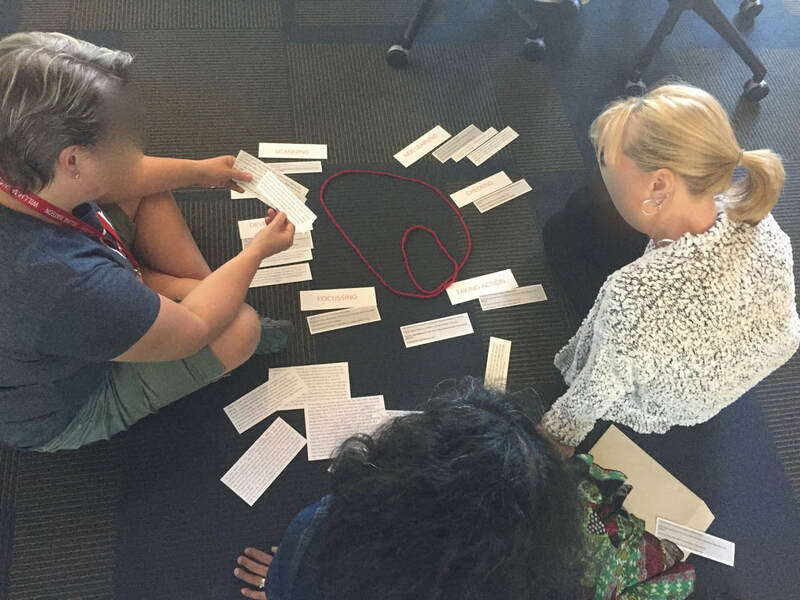 When we reconnected again this past week, we continued to talk about the power of our language as teachers, and how what we say matters. Two of our teachers led us through an activity for our book club. We are reading Tracy Zager's Becoming the Math Teacher You Wish You'd Had. They asked us to read and sort several statements teachers often use into piles that would or would not encourage student risk taking. Some phrases were easier to sort than others. We discussed that our tone and intonation matter, as well as our knowledge of our students. For example, the phrase "I have a great challenge for us today" may cause some confident students to feel excitement; whereas, a student with a diminished belief in their mathematical abilities, may be intimidated by this statement. It was another reminder that what we say matters. As teachers, we hold a great deal of responsibility in setting the tone of our classrooms. If we want to create safe spaces where our students believe in themselves, take risks, see mistakes as learning opportunities, then we must intentionally develop this. We do through our daily interactions with our students, the learning opportunities we design for them, and through taking the time to reflect on our actions to ensure they match our core belief and intentions. Setting Intentions - One Word 2018! And with the blink of an eye, another year has passed! The recent winter holiday was wonderful. We had two weeks off after Christmas which allowed time for much reflection on the year, a renewal of energy and spirit, and time to think about my 2018 One Word. Choosing a single word to guide my year has been a tradition I have been doing since 2012. I've written previous blogposts here and here. I've never been a big fan of New Year's Resolutions, as they felt a bit like a pass/fail test; whereas, choosing a profound word to inspire and create intention in your life sounded far more inviting! It seems this tradition is catching on with others. Originally, I heard about One Little Word from a friend who followed Ali Edwards, a blogger who leads workshops on One Little Word. In the fall, another friend introduced me to Jon Gordon, one of the authors of One Word That Will Change Your Life. 2017 was the year of Hygee! Reflecting upon the year that I had, I can tell you with all honestly, my "One Word" made a difference. Placing emphasis on "hygee" helped me to move beyond a year of sadness (the loss of mom) and into a place where I could take comfort in the sanctuary of life. Simply being home with my family, or time spent alone, or through togetherness with others, I felt love, joy and a general sense of well-being. Small things like nightly walks with the dog and Scott, a cozy pair of socks, lit candles, new jammies, and hearing "I love you" from either M & M - all of these things brought me gratitude, serenity and inner peace. This was much needed. In September, I started a new position in my school district. I went from multiple roles to a district position where I support teachers and students in Numeracy in a broader sense. With any change, there is a ton of learning and challenges. There are also many positives, like developing relationships with 'new to me' colleagues. My learning curve has been steep and my pace has been insane (a result of not knowing what I don't know, wanting to do well, and the high expectations I place on myself). A pace like this doesn't leave important time for reflection and causes the work-life balance to tilt. My colleagues shared their wisdom with me, but as we know, learning needs to be experienced. And I needed to learn from my own experience. Having four months in the new role, and understanding the power of a word to make a positive impact, this year my 2018 word is CULTIVATE. I truly believe that we create the life we want. Joel Osteen, speaks of the power of "I AM" in his book, The Power of I Am. He says "whatever words follow the words 'I am' will determine what your experience will be. You can either speak defeat or power into your life". Generally speaking, I consider myself a fairly optimistic, positive person, but these past few months professionally, self-doubt has crept in. Similar to a first year teacher, I have felt overwhelmed, compared myself to others, and felt an overall a lack of confidence. Herein lies how my One Word 2018 originated. 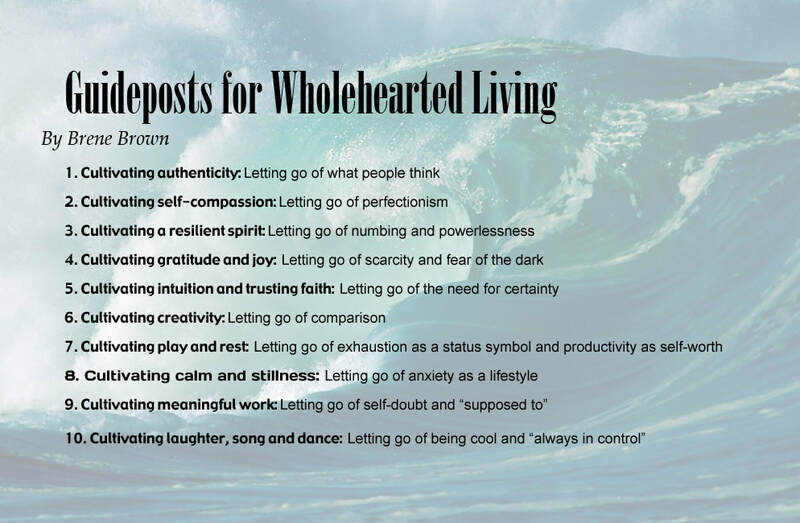 Brene Brown, talks about WholeHearted Living in her book Daring Greatly which I read this past summer. She refers to ten guideposts. Professionally, her ten guideposts struck a chord with me this holiday when I picked up her book again. I saw myself and a need to cultivate. If I want to create a life where the words that follow "I am" include "enough and happy" I needed to stop speaking defeat into my life. Things need to change; I need to cultivate. and be willing to be vulnerable and bring my voice to the table to share opinions and questions. This means being okay with making mistakes, being wrong, and being willing to present my most authentic self. I am looking forward to the process of letting my 2018 word guide me! I know there are things I need to cultivate personally but one thing at a time! Last week I continued to work with two teachers at Betty Huff who teach Grade 3 and 3/4. On Monday, I popped by their classes to assist in introducing patterning. 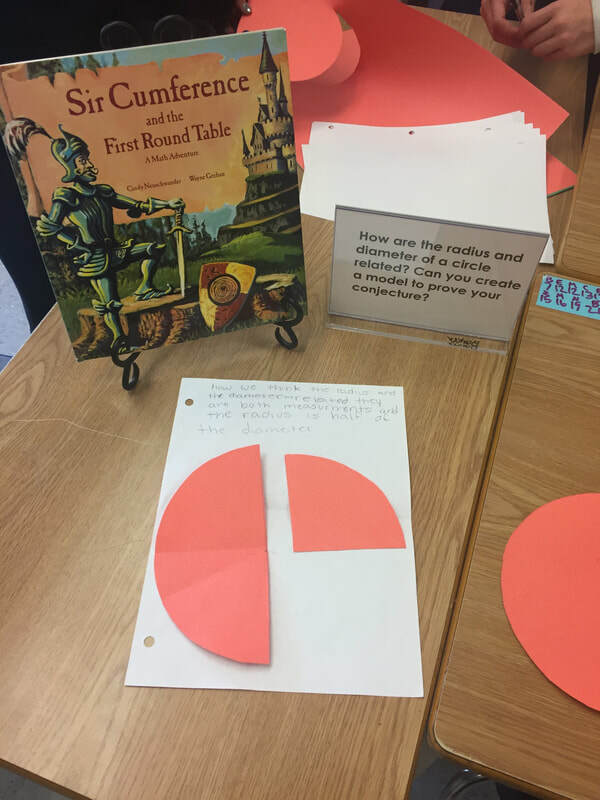 Inspired by Kristen's Gray's blogpost on Talking Points, which she used as a pre-assessment, we decided to try this strategy with the Grades 3/4 class to see what the students knew about patterns, as well as reveal any misconceptions they may have. 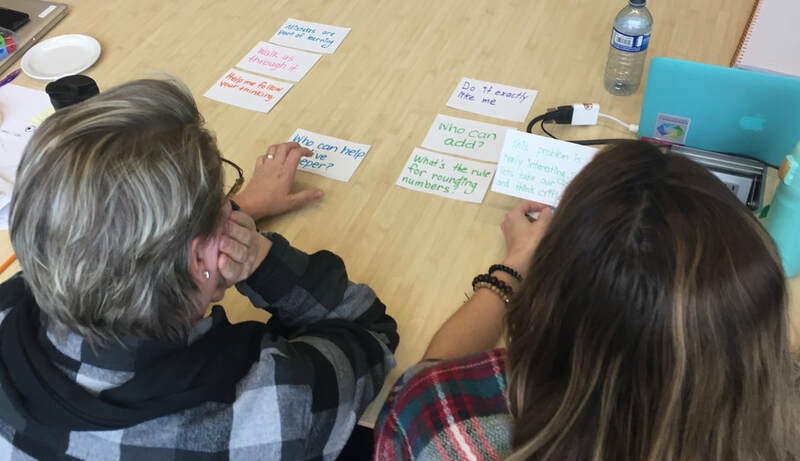 We reviewed the revised curriculum for Grades 2-4, in particular the learning standards for patterning to determine the talking points to use. I've added the word doc file for the patterning talking points below the post, should you wish to adapt these and try it with your class. Since "Talking Points" was new to the students, we decided to adapt it from its original version. For those of you who have never heard of Talking Points, you'll want to read either Kristen Gray's blog post or the one on Cheesemonkey Wonders site. 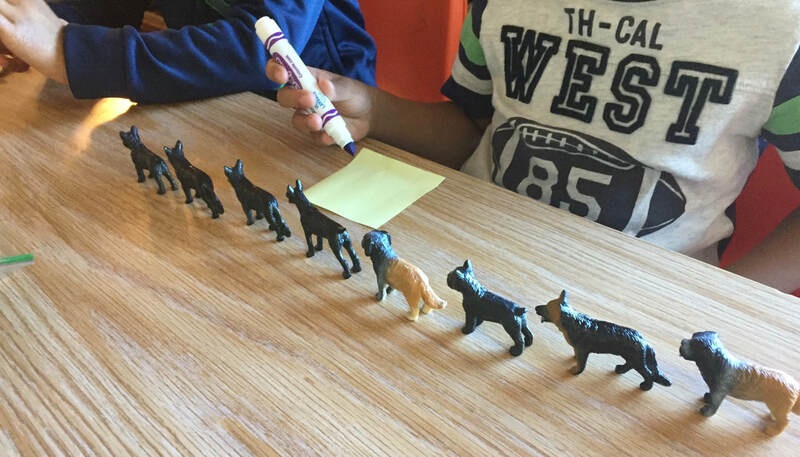 Instead of using Talking Points in small groups, which we will do one day, it was decided to begin by using it with the whole class so the students could see how the activity works. Prior to coming to the carpet area, we had the students read each of the five Talking Points and where it said "Round One" they marked whether they agreed, disagreed, or were unsure of the point. Next we gathered at the carpet and each student was asked to share aloud what they wrote and give a reason why. The other students listened to each of their peers but did not add any comments. As we went around the circle in the first round, the teacher and I quickly realized that although many students agreed "Patterns are predictable," they really had very little understanding of increasing or decreasing patterns, positional patterns, using numbers to describe patterns, and whether or not patterns could help us solve problems. Most students explained that they "couldn't remember doing that last year" or "I've never tried that". 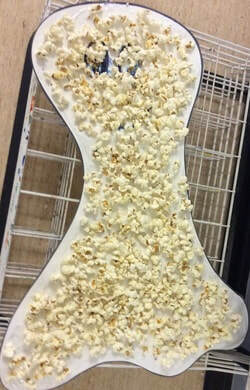 This was really important formative assessment. 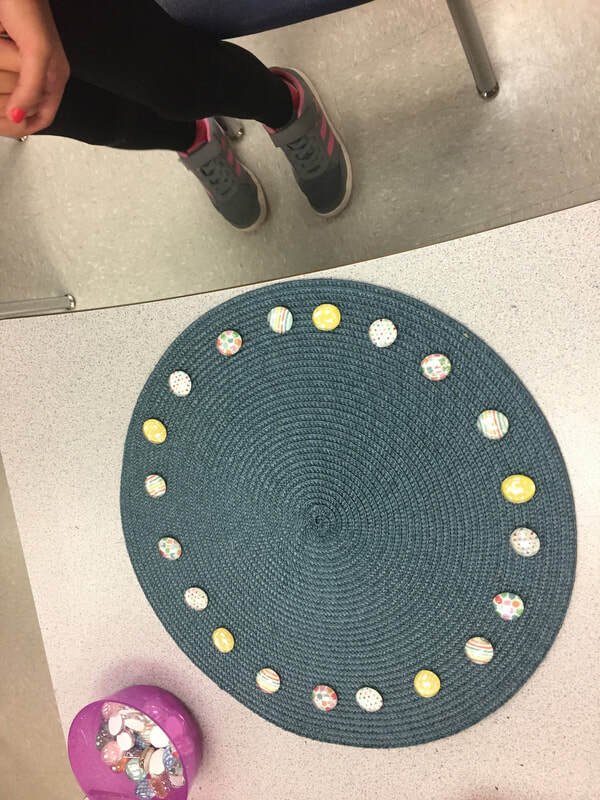 The teacher and I realized that we needed to spend some time revisiting repeating patterns and exploring positional patterns before we could investigate increasing and decreasing patterns. We wondered whether what the children knew was representative of their knowledge or perhaps indicative of lack of experiences with these types of patterns? 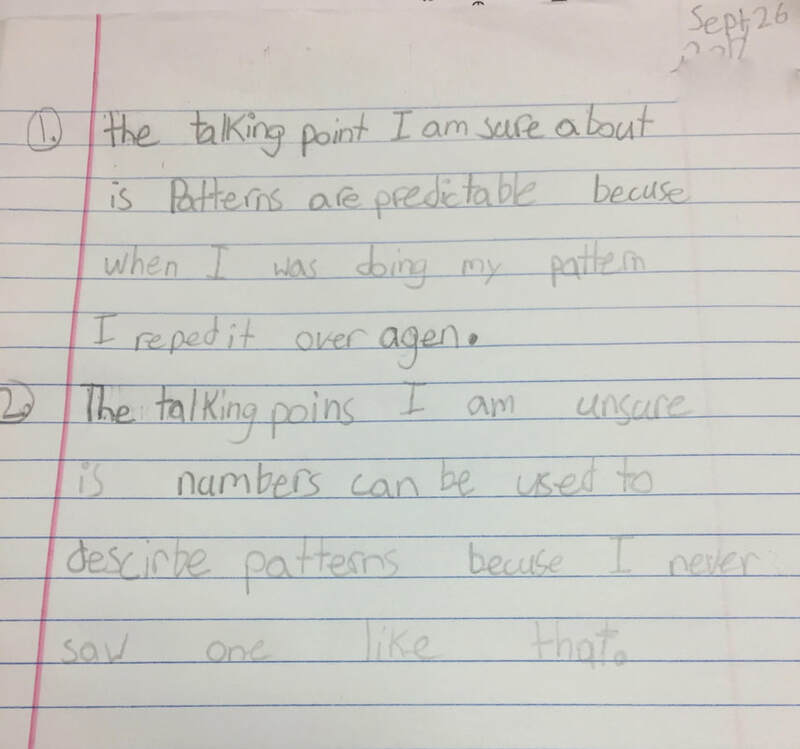 In speaking with another Grade 3 teacher, she mentioned that they had only worked with pattern in September and not since. Being responsive to what we were hearing, we knew that moving ahead into Round Two wouldn't necessarily cause any new thinking, as so many were unsure. We decided to tweak our plans and had the students return to their tables and engage with creating patterns. We had set up materials prior to the class and in retrospect, I wish we had of provided a table area where all the materials were the same (e.g., same size and colour) such as beige toothpicks for the students to explore creating patterns using one item in creative ways such as positional patterns. There were opportunities for students to build increasing/decreasing patterns. We hoped these experiences might activate more prior knowledge and/or cause students to shift some of their thinking. Which Talking Point are you sure of and why? Which Talking Point are you unsure of and why? I was pleased to see how some students used examples to explain their thinking. 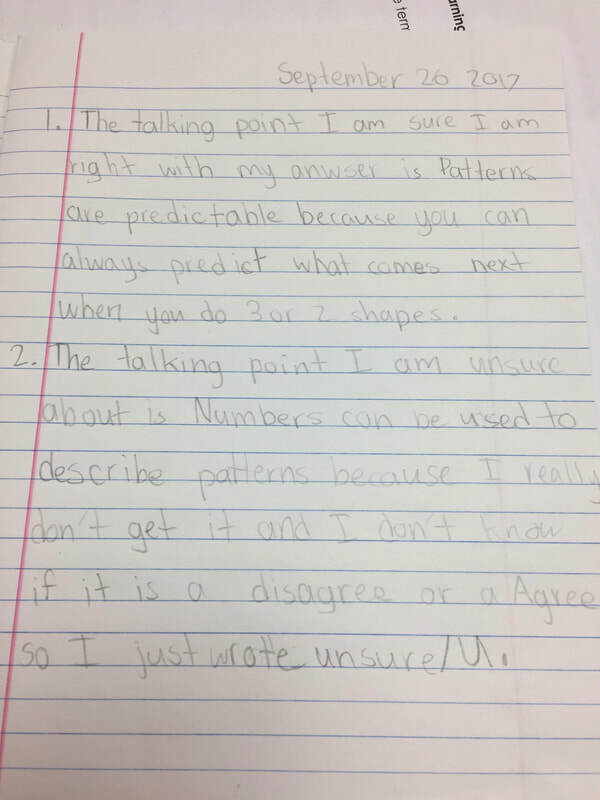 The next time the teachers have the students reflect in their Math Journals, they will highlight examples like this, so students are able to see how using examples can strengthen their arguments. 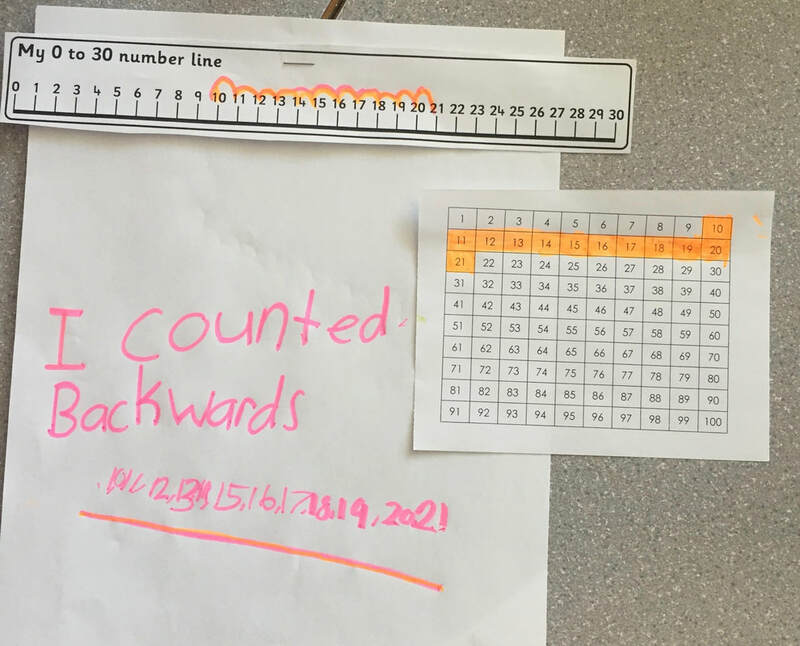 Additionally, when reading their reflections, it became evident that students did not have some of the mathematical vocabulary around patterns. 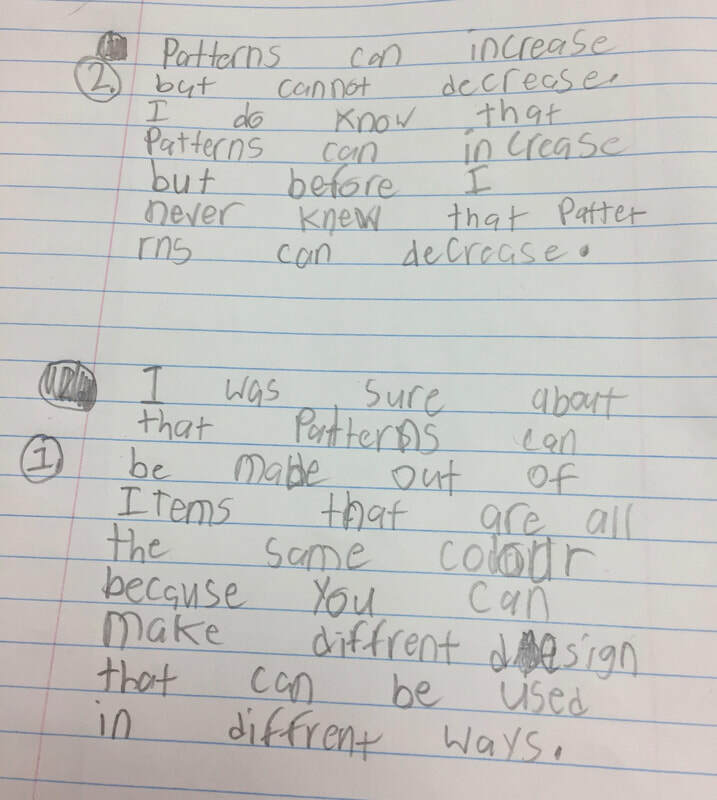 For example, in the last journal below, the student wrote "...patterns are predictable because you can always know what comes next when you do 3 or 2 shapes". I wonder whether she understands the term elements or what a pattern core is? These are important for clear communication. I am excited to continue to use Talking Points to explore students' understanding. We will revisit these points again upon completion of this unit (and likely there will be a blogpost!). 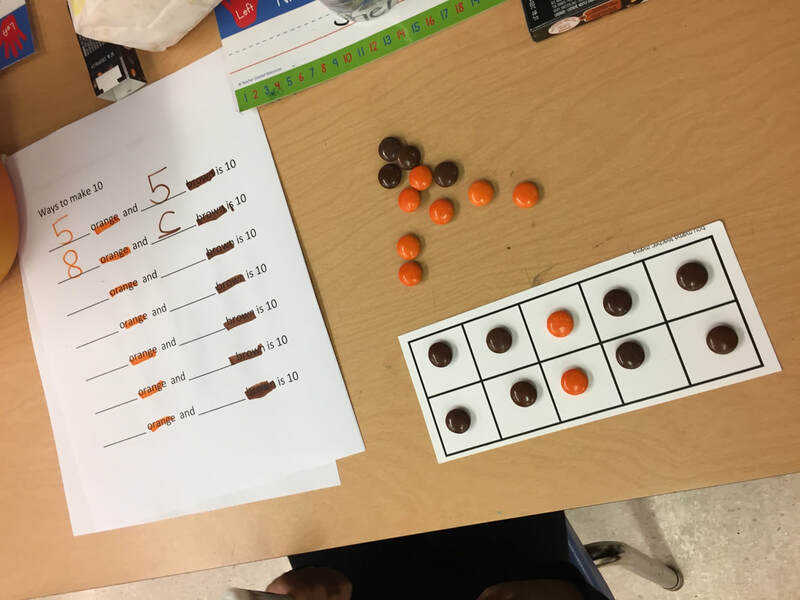 Although the teachers will wrap up the patterning unit at some point, the teachers realize that this does NOT mean they are done patterning for the year. As we know from the First Peoples Principles of Learning, "Learning takes time and patience". We need to remember that learning is recursive. 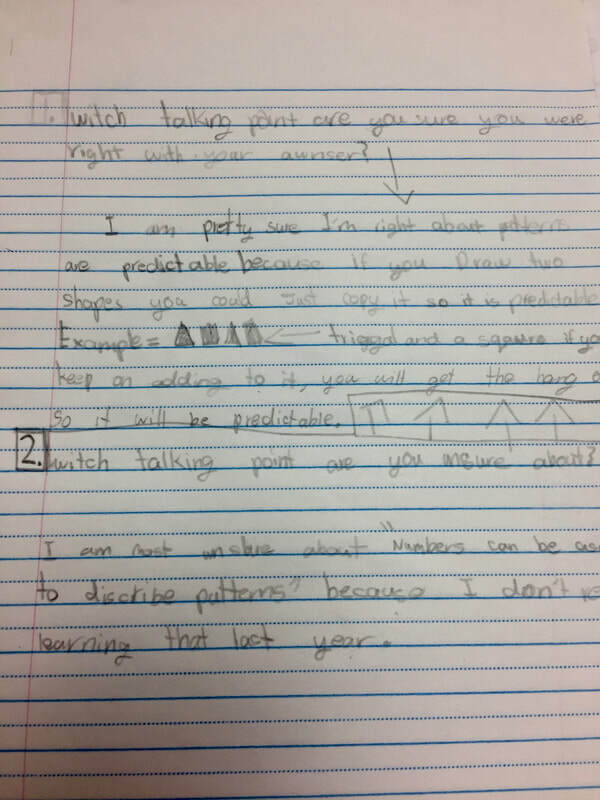 Patterning WILL be revisited throughout the year. 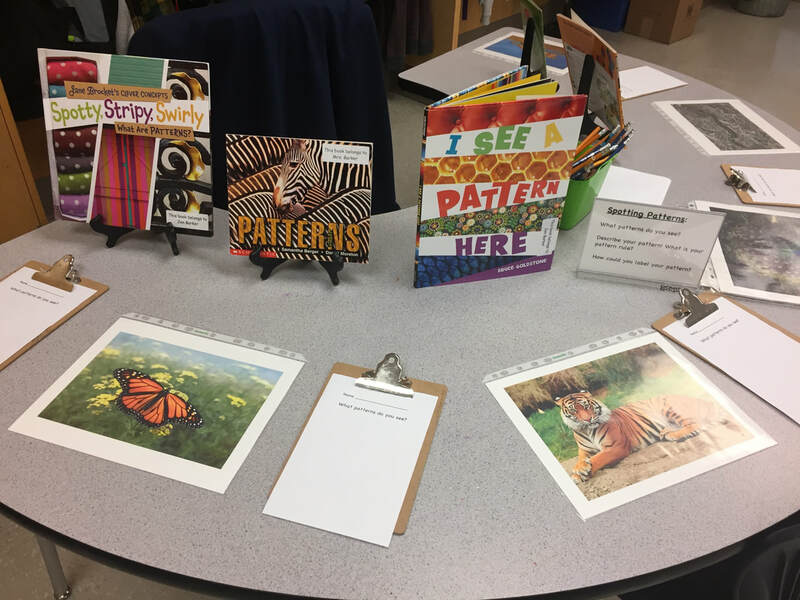 These teachers intentionally will include patterning in their daily number routines (e.g., an image of pattern is presented and students guess the rule, predict the fifth term, etc. 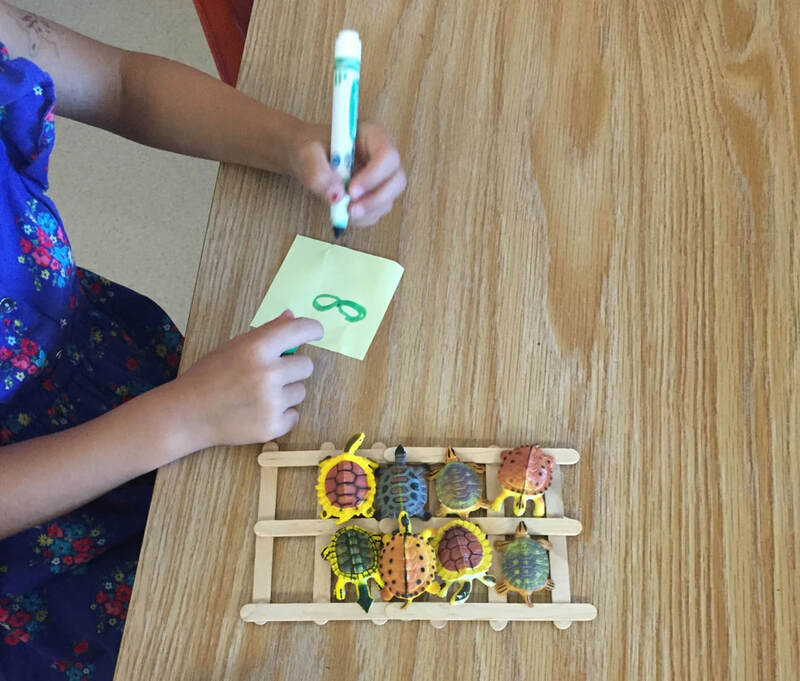 ), including patterning activities daily math investigations and weekly rich problems, and whenever it makes sense to do so. 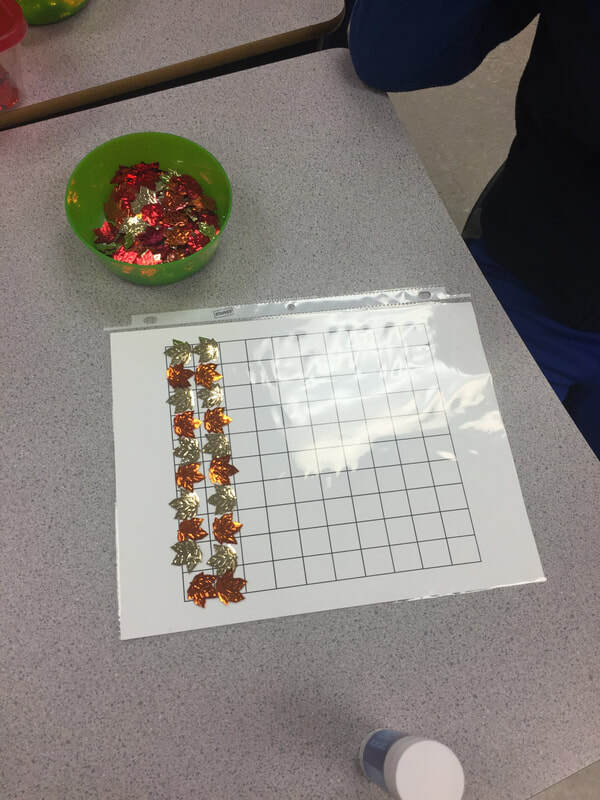 ​Today I had the pleasure of working with a lovely Kindergarten class at Jessie Lee Elementary to introduce Counting Collections. I began by reading aloud the book If A Chicken Stayed for Supper by Carrie Weston. In this delightful tale, five little foxes sneak out of their den, despite being told by their mother to stay home while she goes out looking for dinner. While out playing, the foxes begin to worry that perhaps one of them may get lost in the dark. The eldest fox, Tufty, decides she will take charge and count her brothers and sisters. She taps each fox on their nose but forgets to count herself and mistakenly thinks they have lost someone. All of the foxes begin to cry. Next, the second eldest fox, Mufty, tries his best to count, pulling each fox's tail but again he forgets to count himself and ends up with a count of four. Again, the foxes think they are one short. In the end Mother Hen comes to the rescue and lines up all the foxes and taps each one on their head. The foxes yap with joy! "You've found one of us! Thank you! Thank You!" 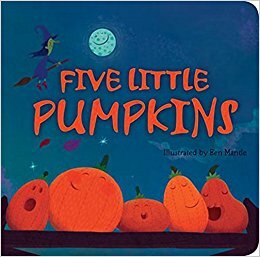 I use this engaging story to springboard children's ideas about strategies they can use to keep track of quantities when counting. We discuss, what different ways did the foxes and Mother Hen use to help keep track? How do you keep track? 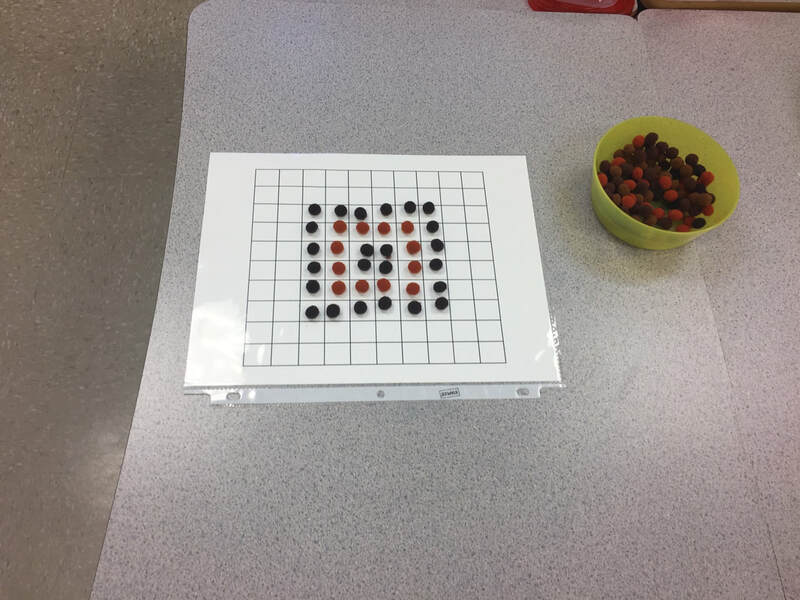 To assist the students with one-to-one correspondence, we provided five and ten frames, as well as small soup cups for the students to use should they wish to. We explored how these 'tools' help us to organize our items and potentially see groups of items. 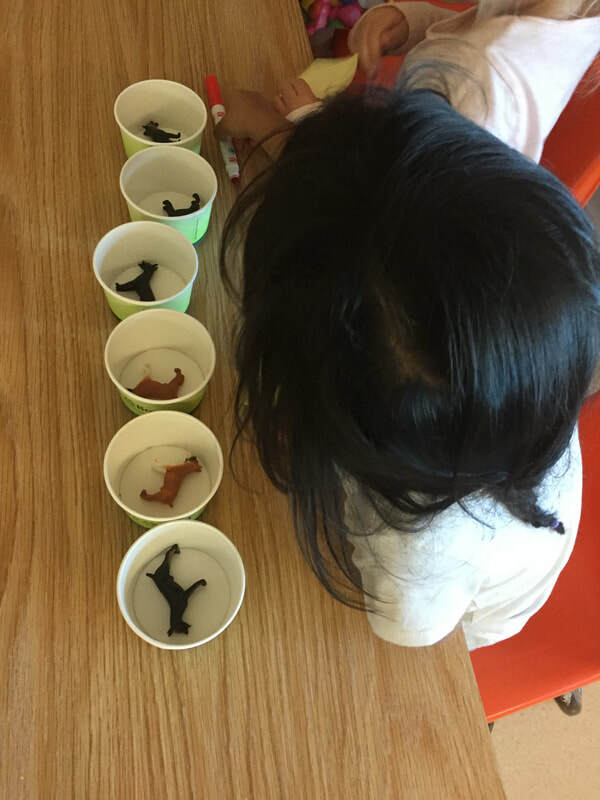 For many students, having cups available to place one counting collection item in at a time, helped them to keep track. Sometimes at this age children will skip an item when counting or count the same item twice. Additionally, not all children have a solid understanding of the stable order of the numbers (e.g., they might say "one, two, three, five"... skipping four). 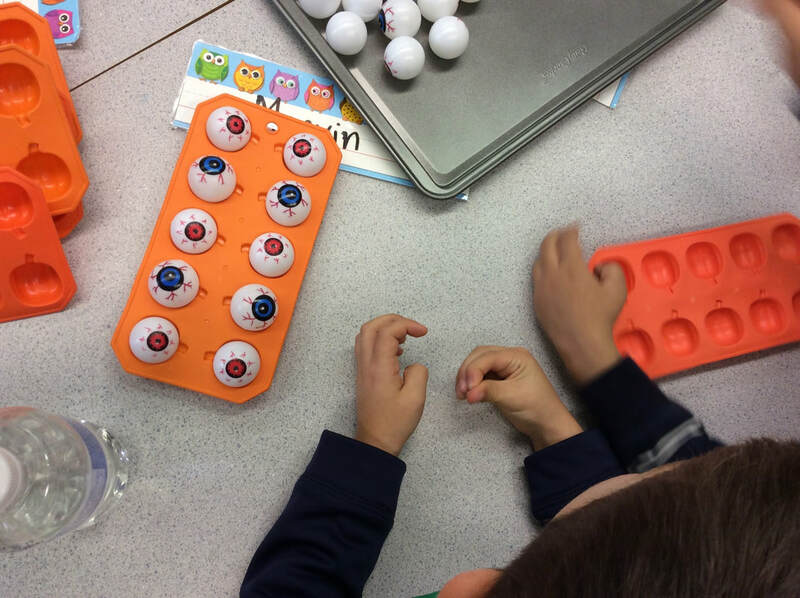 Counting collections provides a wonderful opportunity for one-to-one correspondence, learning the correct of numbers, and cardinality (knowing the last number you say represents the total amount of the set) . For more information about Counting Collections, please check this blogpost and under the Ideas section - Counting Collections. An important point another Numeracy Teacher (thank you Janice) reminded me of, is the focus on working with partners in September. Counting Collections is something we do with others. In the K class on Wednesday we discussed how we work with partners. How do we respond to a partner when we hear there name called with ours? We modelled some positive options, including giving a "high five" and saying "I'm happy to be your partner". In a respectful classroom community, students need to understand that they will be required to work with others in friendly ways. We included the students in helping us to determine how to work out who chooses the counting collection bag and who chooses the tools. On this day, it was determined that the taller partner would choose the collections. 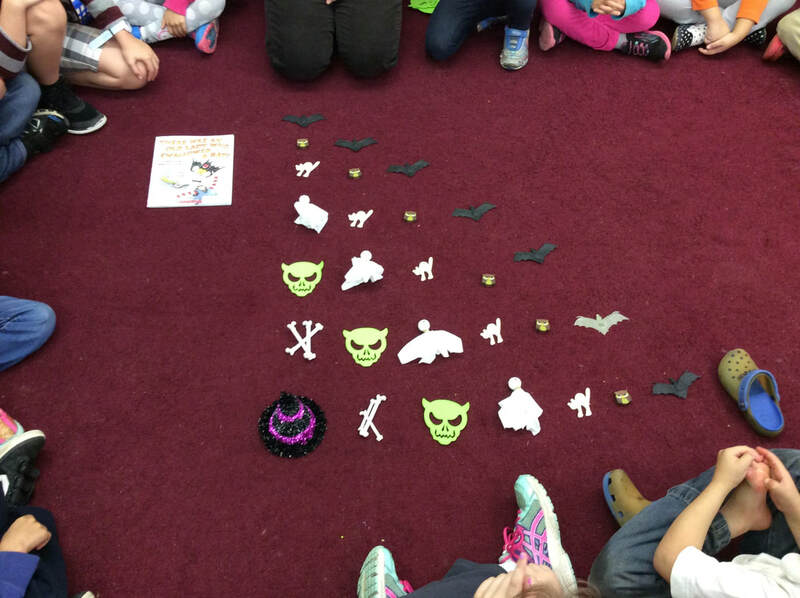 We also modelled how to help each other to organize the collections and take turns counting.